PRODUCT DESCRIPTION: Liquid concentrate you mix with water and then apply over plants such as flowers or ground cover with the sole purpose of targeting broadleaf weeds. It's unique formula will accomplish this task without hurting the flowers or ground cover you wish to keep. 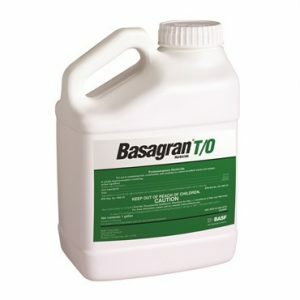 WHERE TO USE IT: Though Basagran can be used in most anywhere, it is mostly used where over beneficial plants like flowers and ground cover where it's unique ability to target bad plants is featured. RATE OF APPLICATION: 1 oz per gallon of water per 1000 sq/ft of turf or plants.